We offer various coilers and winders for your processing needs. From the simplistic Model 814M designed for manual coiling of small flexible tubing, to the more exotic Model 200-3 with dual wind up wheels capable of in-line coiling of flexible pipe and tubing. 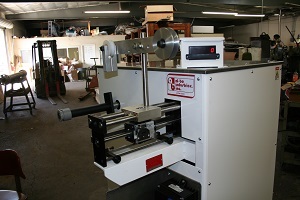 All our coilers and winders can be equipped with optional level winders for a more even wrap of your extrudate. 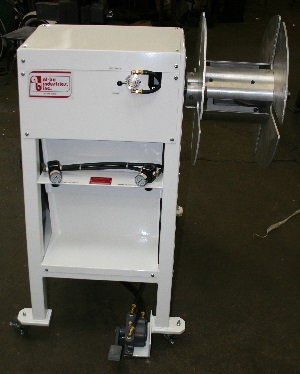 Following is a listing of our standard coilers and winders, all manufactured in Fullerton, CA. We have also designed many custom coilers to suit exact needs. For additional information, please contact the factory. Model 814M: 8" wide by 14" diameter "hubless" coil capacity, or single shaft for use with existing spools. Air driven, no electricity required. 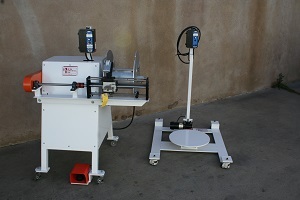 Speed control manually operated via foot pedal mounted on winder frame. Typically used for small flexible tubing and profile. 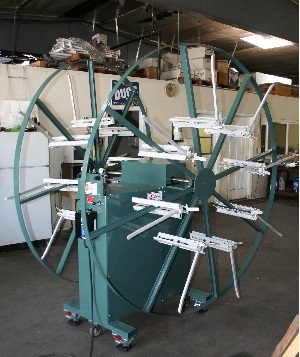 Model MS-12: Able to accept up to a 12" wide by 18" diameter spool, the MS-12 winder is primarily used to coil flexible tubing from a relaxed condition (typically from a drum style receptacle that has allowed the extrudate to relax prior to winding). The MS-12 can be considered an in-line winder, as the take-up speed (600 rpm maximum) is sufficient to allow the operator ample time for change over in most extrusion applications. With both the speed and torque functions of the MS-12 being individually controlled, over-tensioning and compression of the extruded flexible tubing is minimized. 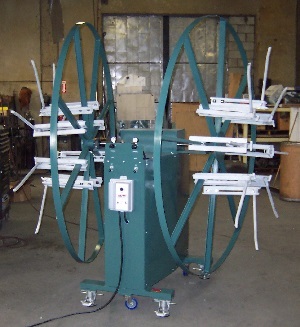 Model 200-3: The Model 200-3 pipe coiler has a capacity on the ID adjustable from 20" to 40" with up to a 72" OD. 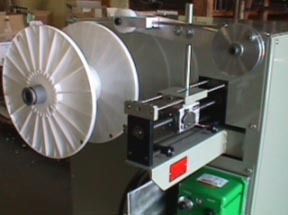 Coil width is adjustable from 4 1/2" to 13". Equipped with dual take up wheels for continuous operation and toed in for smooth wind up on both wheels from one source. Able to coil up to 1 1/2" diameter polyethylene pipe and over 2" diameter hose, it's our largest winder with positive chain driven wheels for maximum torque. 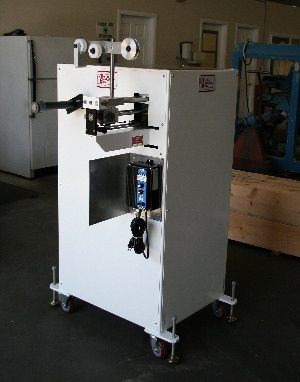 The Model 200-3 can be ordered with manually retractable arms, or full pneumatic operation with single valve actuation for quick changeover from one wheel to the other.